It’s good news and bad news for Staten Islanders as Thanksgiving approaches. 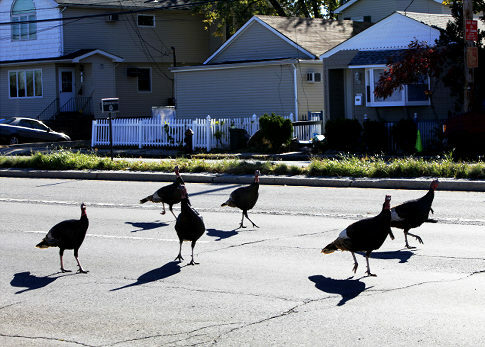 The bad news is that wild turkeys are taking over the streets. The good news is that there’s no need to go to the supermarket to pick up the main course. Apparently, a local mental patient freed her nine pet turkeys over a decade ago. Now residents say the turkeys have multiplied into the thousands, leaving lawns covered in poop and people afraid to leave their homes. The turkeys are protected by city law so hunting them is illegal. It really would work out but then you open up Pandora’s box for Chinese restaurants serving cats and dogs. Genius state officials are surveying locals to try to find the best solution, which means the problem will be solved in about 22 years. Hmmmmmmmmmmm, let’s see, shall we? What’s a way to get rid of turkeys the week before everyone eats turkey? Beats me! Only in Staten Island can you celebrate Thanksgiving with turkeys flying around on your front lawn. Thanks crazy lady!